“Recursive Funktion” is a new original funk/fusion track for guitar, bass, keys and drums. As is my normal practice, I play/record the guitar & bass parts “live” and use midi & soft synths for the drum and keyboard tracks. “Fools Rush In” may the the last oldies video for a while; I have no others planned right now. That could, of course, change should I think of some I’d like to do. The inspiration for my version dates back to Ricky Nelson and his recording from 1963. “Dis-Funk-Shun” is a new composition in my fusion format of guitar, bass, drums and keyboard. Please check it out! Taking a little detour from the oldies/trio arrangements…here is an original instrumental composition in a “classic rock” style that recalls a little bit of Deep Purple, a little bit of Steppenwolf, and maybe even a little Sly and the Family Stone. “Honky Tonk Night Train” is a mashup/medley of two famous blues-based instrumentals from the 1950’s, both of which have been covered countless times. “Honky-Tonk” was a hit for Bill Doggett in 1956. “Night Train” was first recored in 1951 by Jimmy Forrest. I thought they went well together. 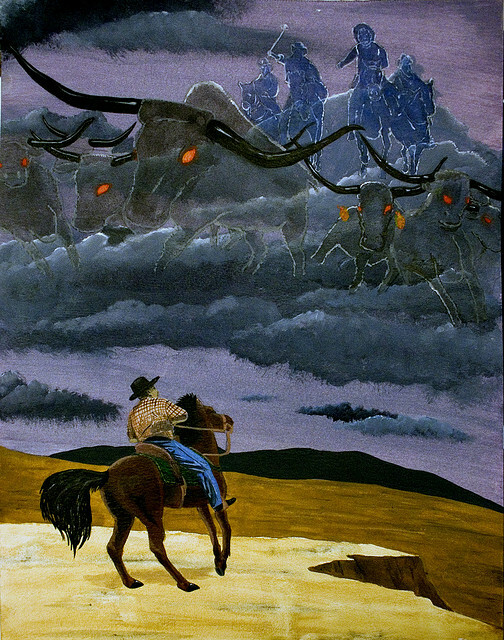 “Ghost Riders in the Sky”, originally written and recorded in 1948 by Stan Jones, is one of the most recorded songs in history, covered by an amazingly wide range of artists including Burl Ives, Vaughn Monroe, Bing Crosby and Peggy Lee – all in 1949, and later Elvis Presley, Tom Jones and Johnny Cash. It is also well represented as a guitar instrumental by The Ramrods, The Ventures, the Spotniks, and Dave Allan and the Arrows. In many ways, this song “started it all”: “Rumble”, originally performed, recorded and released by Link Wray and the Raymen in 1958. It was one of the very first guitar instrumentals. It introduced a distorted guitar tone and “power chords”. It is one of very few instrumental singles banned from the radio airwaves…presumably because of its title (which was reportedly suggested by Phil Everly, as as it had a rough sound and said it sounded like a street fight).